Rangers are on a roll: last weekend was very successful for Teddy Bears, as they defeated Partick Thistle 3-0. If you want to try your hand and bet on next weekend’s games, make sure to use bet365 bonus code to unlock benefits that will boost your bets. Last week’s game highlights include Ross McCrorie heading his first senior goal following Daniel Candeias’ cross and Candeias then doubling the lead from close range. Finally, Josh Windass slotted home Rangers’ third shortly after the break. Rangers collected 24 points so far, and are currently ranked fourth on the table, with Celtic at the top (30 points), followed by Aberdeen (27 points) and Hibernian (25 points). Only six points separate the top four. So far during the Premiership Rangers played 12 games, scored 27 goals and conceded 13. They won 7 games, lost 2 (to Celtic and Hibernian) and three matches ended up in a draw. Current Rangers top scorer is Morelos with 6 goals, closely followed by Dorrans who scored 5 goals. Morelos is also an overall top scorer together of the Premiership together with Louis Moult from Motherwell. You can buy tickets from £24 for adults, £17 for concessions and £6 for juniors. Also, a limited number of half season tickets are on sale, priced from just £30 for kids & £155 for adults. Prior to this match, he two teams have met on September 30th. In that game Rangers managed to win over Hamilton with a score of 1-4. Betting odds say that Rangers have a 76% chance of winning, while Hamilton has 9% chance, and there is 15% chance that the game ends in a draw. Seeing that Dundee is ranked lowest on the table, Rangers can safely hope to add another 3 points to their current score, but they will do it easier with our support! 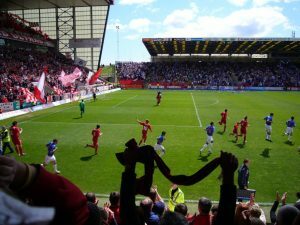 The most challenging game awaiting Rangers this month is bound to be the clash with Aberdeen. Their last confrontation in May ended unfavorably for the Rangers, who lost 1 – 2. The reason more to attend the game and lift our player’s spirits! 1 Foderingham, 2 Tavernier, 40 McCrorie, 6 Wilson, 3 John, 21 Candeias, 8 Jack, 23 Holt, 11 Windass Substituted for Kranjcar at 69’minutes, 9 Miller, 20 Morelos Substituted for Hardie at 85’minutes.